Smart. Responsible. That's seventeen-year-old Breanna's role in her large family, and heaven forbid she put a toe out of line. Until one night of shockingly un-Breanna-like behavior puts her into a vicious cyber-bully's line of fire—and brings fellow senior Thomas "Razor" Turner into her life. Razor lives for the Reign of Terror motorcycle club, and good girls like Breanna just don't belong. But when he learns she's being blackmailed over a compromising picture of the two of them—a picture that turns one unexpected and beautiful moment into ugliness—he knows it's time to step outside the rules. And so they make a pact: he'll help her track down her blackmailer, and in return she'll help him seek answers to the mystery that's haunted him—one that not even his club brothers have been willing to discuss. But the more time they spend together, the more their feelings grow. And suddenly they're both walking the edge of discovering who they really are, what they want, and where they're going from here. There are not enough words to describe how much I love Katie’s McGarry’s books. I know that whenever I pick up a new book of hers I will immediately love it. I just know that it will be a book that I have a hard time putting down. Walk the Edge was everything I wanted and so much more, it was the perfect book to read. We follow the characters Razor and Breanna as they must work together to uncover a mystery of the perpetrators behind a photo while also working together to uncover a mystery from Razor’s past. However, there is danger lurking from the rival club that can put both of them in danger. Breanna was such a great character. She is this smart, straight A, never lets her parents down and then she meets the boy. I think what I really liked about her was that under all that perfect skin there was a girl with insecurities that people never assume is there because she never messed up but when making one mistake her whole world comes crashing down. It felt, while reading that I was there for her as she went through everything. Razor on the other is swoon worthy. I swear Katie McGarry can write the best guy characters that makes you want wish they were real. He is the bad, tough guy character that will melt your heart. The relationship between these two characters is so great. It has its ups and downs and at the end of the novel all you want is more. This book will pull your emotions every which way and having you fall in love with Katie like you are meeting for the first time. This was a stunning read which allowed me to escape reality and learn that no matter how smart or well put your life together, not everyone has it all together and every now and then it is okay to let loose and make a mistake. 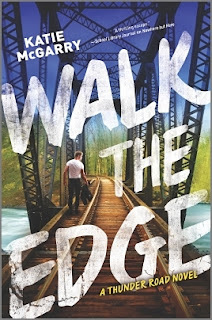 Walk the Edge will have you on the edge of your seat and take you on a journey full of adventure, love, sadness, and joy. A beautiful story! Awesome review, Chase! I so agree with your take on Walk the Edge - and with Katie McGarry, in general. I loved Razor and Breanna's stories. Katie has created two more characters that feel so realistic and are so empathetic. I'm really loving the Thunder Road series.